I've finally got back into routine of the makeup products I'm using, when you have to do your makeup at 3am for work you really don't want to have to think about what you want to apply you kind of want to just know. So the past month I've been using these exact products while applying them all like a zombie so I thought why not update you all on what I'm wearing these days! To prime my face I've been using my trusty Smashbox Photo Finish Primer which is currently on it's last legs and I'm trying to use as little as possible until payday comes around so I can buy a new tube. I absolutely adore this primer, it gives you such a nice smooth base to work on and it literally keeps my makeup on me all day keeping it from going patchy or disappearing! I've also been using the Smashbox Photo Finish Under Eye Primer while this is something I don't see myself buying in full size I'm still enjoying using it. It helps make you look awake and to brighten the eyes, which is great when you've only gotten 3 hours sleep. It's also really soothing to apply. Onto my base products I will admit I've been trying different foundations lately but I've still been using my trusty Rimmel Match Perfection Foundation. I've been wearing this foundation since I got into makeup and in my opinion its one of the best drugstore formulas and I just adore the finish and coverage it gives you. I'm forever stocking up when Boots have a 3 for 2 on because I just adore it so much. It's almost time to treat myself to some more as I'm slowly but surely running out of bottles. As always concealer wise it's the Collection Lasting Perfection no other concealer compares to this for me. It covers anything I want it to and its super affordable. Although I do find the bottle gets really grubby after awhile and the writing disappears I don't plan on stopping buying this for a very long time. Finally powder wise, lately I've been enjoying the Soap and Glory One Heck Of A Blot Powder. Although it's aimed more so at those who have oily skin I find that it doesn't cake on my dry skin which I like. I also find it lasts a lot longer than any other pressed powder I've tried. For my brows I've been trying lots of different products lately and I've been switching between a lot of different ones. But for the purpose of this post I decided to feature the one I've been using this week which is the Tanya Burr Perfect Brows Palette. I haven't used this in the longest time and re-discovered it at the bottom of my makeup drawers during the weekend so decided to start using it again. I love the powders in this, they aren't too powdery and I can mix them for a lighter or darker brow depending on my mood that day. Although not featured in the photo above I have also been using the Makeup Forever Brow Pen which I'm still really enjoying. I wrote a post all about it here if you'd like to read more! For eyes I've kind of given up on gel liner at the moment because literally gel eyeliner adds an extra 10 minutes onto my makeup routine because I have to try and get it as even as possible, which lets be honest never actually happens! For my base though I've been using the Freedom Pro Conceal & Correct Palette which although not the intended purpose it's bloomin fab at keeping your eye makeup looking fresh all day long. I use the lightest concealer in the palette (the very last one) and as it's so light it also gives you an almost white base to work on so the colours you use are always vibrant. For eyeshadow I've been using my Naked Palette as I had completely forgotten about this until last month which is crazy. I'm a sucker when it comes to eyeshadow palettes, they are my weakness. However this means the more I buy the more I forget about other ones so I'm trying to get some use out of the more expensive ones I bought as I've just totally abondoned them for so long. At the moment I'm loving the shades Buck, Sidecar and Smog. Mascara wise to be honest I've been using about 5 different ones lately it all depends on what kind of lash style I want that day and I usually tend to use two different ones to achieve the style. The duo I've been loving this week though is the Seventeen Falsifeye HD Mascara and the Maybelline The Colossal Go Extreme Mascara. I use the Seventeen one first as it doesn't clump your lashes and separates them really well almost like a natural look only a little darker. I then apply the Maybelline one after as I find it gives my lashes a lot more volume than the Seventeen one, also this is extra black in colour which I'm really liking right now! I have also been wearing false lashes lately but I couldn't include them in this photo as I've worn them to death and it's time to buy some new sets, but you can have a read about them in my post here if you'd like. Finally onto bronzing and highlighting, probably my current favourite thing about makeup lately. I've been adoring the Soap and Glory Solar Powder Bronzer I just find that its the perfect shade for my pale skin and it just gives me a healthy looking colour. I'm adoring this product right now and I've actually hit pan in it which is breaking my heart but it just shows how much I'm using it right now I guess. Another Soap and Glory Product but this time for highlighting. The Glow All Out Highlighter is probably one of the prettiest highlighters I own. While it's not too sparkly on the skin it does give the prettiest pink glow to wherever you want it. Its definitely a lot more tamer than some of my sparkly highlights but I have been loving the subtle glow lately. I haven't been wearing any lipsticks or glosses lately as my lips have been so dry and sore so I've just been using lip balm everyday in hopes that they'll soon go back to normal. 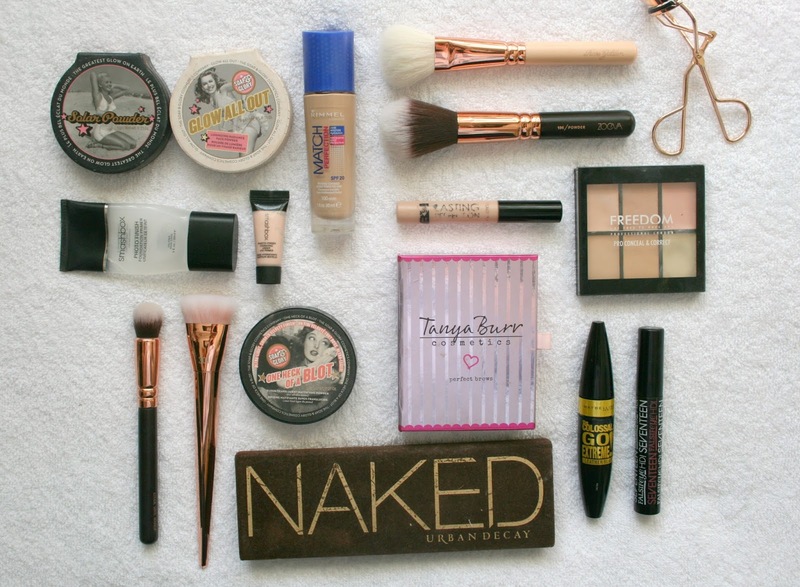 What makeup products are you using a lot recently? I used to love that Rimmel foundation, such a brilliant drugstore product like you say :) I definitely want to try more Smashbox products too! I love Collection Lasting Perfection Concealer! I've also been dying to try out the Smashbox photo finish primer, I need to purchase it before I change my mind! Totally with you when it comes to using the original Naked palette every single day! I got given mine at the end of February and since then I haven't been able to put it down. You've also reminded me I need to try Solar Powder now the suns coming out that touch more! The product I'm reaching for the most at the moment is definitely my creme puff blush from Max Factor and my Mary Lou Manizer over the top for a really nice glowy complexion! I keep eyeing up the Smashbox primer and Naked 1 Palette but haven't brought myself to buy them yet! You have such nice picks! Those brushes look really nice.